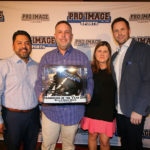 The 2019 Pro Image Sports national convention was held recently in Las Vegas, Nevada in conjunction with the Sports Licensing and Tailgate show at the Las Vegas Convention Center. This was the 33rd annual convention for Pro Image Sports in which sports retail franchise owners from around the country gathered together to network, meet with the corporate support team, strengthen relationships with important vendors like New Era Cap and the Dallas Cowboys, talk shop, and—of course—play in Vegas. Year after year, these small business owners see positive results from attending. “I come back for the camaraderie, and seeing all the guys allows you to pick up new ideas from other owners,” said Joey Solis, a franchise owner with multiple stores in Texas. During the convention’s final evening, awards were given out to franchise owners for salesmanship, sales increases, and other notable successes. Jack Wappes, a young up and comer from North Carolina, was awarded Junior Salesperson of the year for his role in the success of his parents’ store. 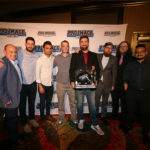 James Quemada and Jose Uribe, who own stores in Palmdale and Topanga, California, won the Pro Image Sports Social Media GOAT award for their efforts engaging with their customers via Instagram. 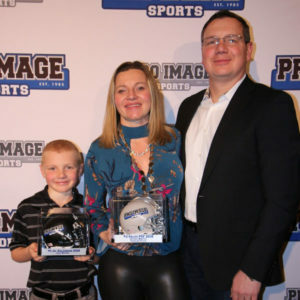 The Moulton Team, who own and operate a Pro Image Sports in the Mall of America, was the #1 sales team in 2018. The capstone of the night came as the Franchisee of the Year awards were each given to the Benipal and Walsh teams. The Benipal team owns multiple stores in the northeast United States and was awarded the multi-store Franchisee of the Year award. They’ve always been innovative in the way they approach the sport retail business and found great success in the wake of the Eagles 2018 Super Bowl victory by partnering with ’47 Brand and creating unique shopping opportunities for sports fans. The Walsh team owns a store at Pier Park Mall in Panama City Beach, Florida and was awarded the single-store Franchisee of the Year award—named after successful single-store owner Danny Felix. The Walsh’s business was shut down for 12 days in Q4 of 2018 because of the destruction caused by Hurricane Michael. Still, they were able to find hope, rally together with their community, and reopen to a strong finish in 2018. WATCH THE 2019 PRO IMAGE SPORTS CONVENTION HIGHLIGHT VIDEO HERE! Next → Next post: Mike Young on the Move!